Today, I decided to make a book jar. All you need is a mason jar, strips of paper and a massive TBR pile. 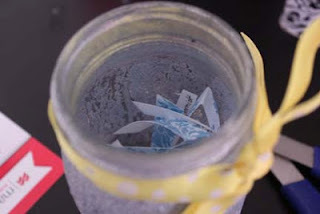 Write the name of your TBR books on the paper and place them in the jar. Whenever you need a book to read just shake up the jar and pull out a book. For blog purposes Kat and I will choose a book from the jar and that will be our book to read for the month. 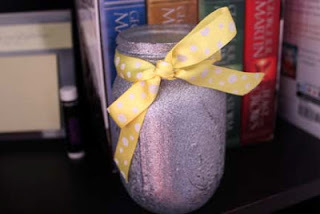 Glitter spray paint + Mason Jar. This one is leftover from decorations I made for a bridal shower. 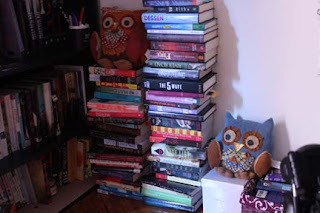 Our TBR pile, doesn't look that bad. Right ? Cut paper into strips and start writing. 1. In a deep container or box spray your mason with the glitter paint. It can get messy so be sure to cover up any furniture. Apply two even coats and let it dry. 2. While your jar is drying, cut scrapbook paper into strips. 3. Grab a seat in front of your TBR pile and write down the title of each book, add the author if you would like. 4. Tie a ribbon around your jar and fill it with folded paper strips. Shake up the jar and start reading ! This is such a fun, cute idea! And, ohmygosh! Graceling is one of my favorite books EVER! Hope you enjoy! Can I just say what an awesome idea this is! I've been in a serious reading slump myself. Whatever I pick up just does not hold my interest. I may end up trying this idea. I've heard such great things about Graceling, I can't wait to read it. I really like the randomness of having a book jar. I don't think either of us would have picked the books we picked. My sister and I use this! We have SO many books that we still didn't read so it is a great way to force you to pick up books you never would have (even though you actually BOUGHT them :P). It really is. I mean it's so easy to just buy the books but so hard to sit down and read all of them. This is a great idea! I'm definitely going to try it. Amazing idea! I'm definitely doing this. I need a way to get through my TBR books as well, and I just don't have the motivation to do it without some sort of push. This is great I am going to make one very soon!! Thank you for sharing!!! Hahaha, I love the glitter idea. Hope you enjoy your first picks, I about to pick my fourth choice and starting to realise just how diverse the options I put in mine were! The two of you inspired me to make my own, thank you so much! seen your blogs, I really enjoyed going through them. 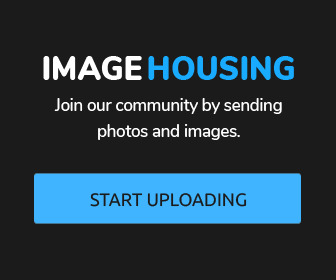 amazing blog, I’d love to discover some extra information. great to discover the post here. to understand stuff. Keep it up. in the blog is out of this world, I so want to read more. famous, due to its feature blogs. site I’m greatly cheerful I discovered this. this blog is perfectly incomparable. contents is really forcing out your readers to give the nice remarks. stuff I haven't been finished particular data in a lasting time. good collection of the articles with informative stuff. all details that you give in your articles. I have already bookmarked your blog!! After browsing some amongst the post I felt this is totally new to me. Anyhow, I’m absolutely happy to find this. you please add more things? good thing in your blog I like that! !